The Gamekeeper’s Cottage is a semi detached period cottage on the farm offering the perfect spot for families and lovers of the great outdoors to get away from it all. 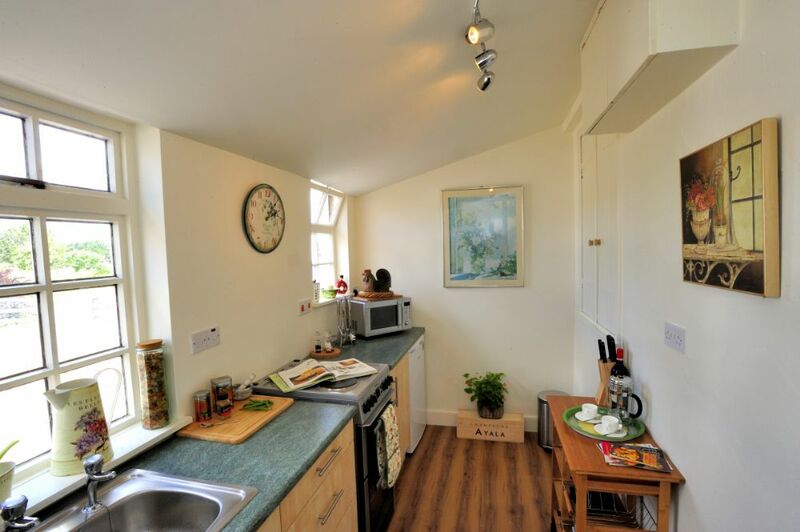 The cottage is light and airy and offers comfortable accommodation presented in a traditional style. A pretty rear garden with outside seating provides the perfect spot for al fresco dining during the summer months. The principal accommodation and the garden have views across fields of horses to the hills beyond. 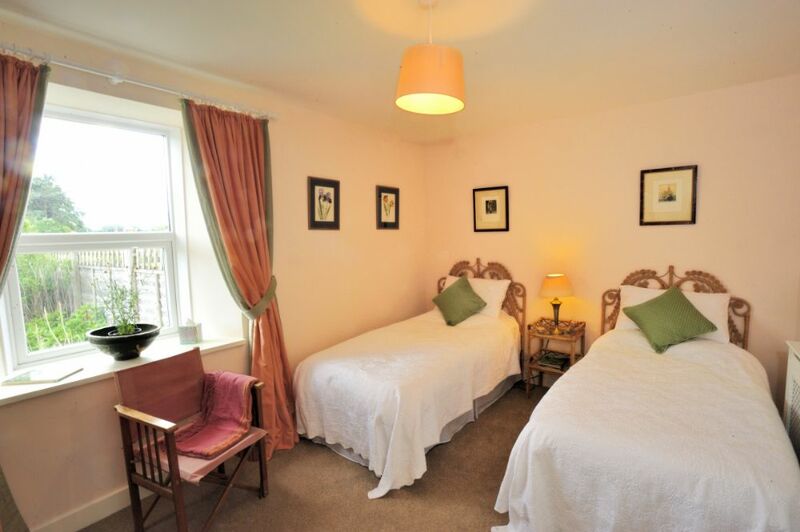 The accommodation is all on one floor and may therefore suit elderly and mobility-impaired guests. 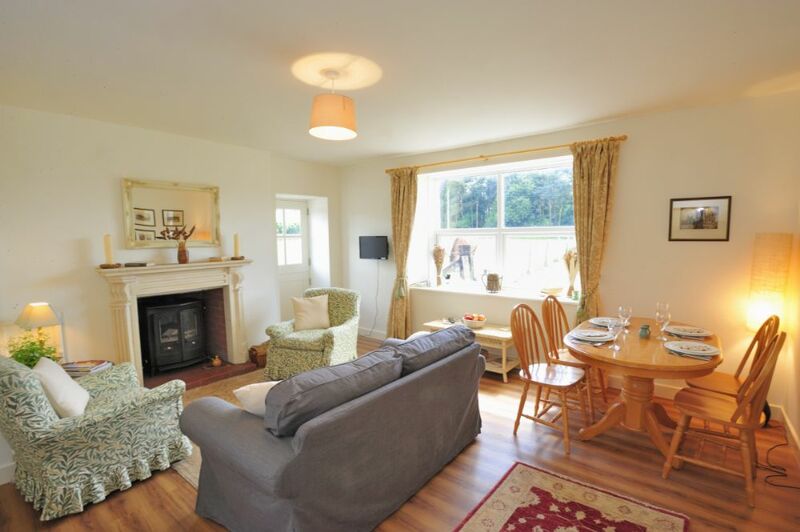 Sitting room with log burner (logs supplied) provides the central heating, TV with Freeview, books, games and radio. Dining table (seats 4). A stable door leads to the outside seating area. Compact, well-equipped kitchen with electric double oven and four ring hob, fridge with freezer compartment, three quarter size dishwasher and microwave. A deepfreeze is available in the secure outbuilding opposite the cottage. Hall / boot room ideal for outdoor kit. Bedroom one with 5’ double bed and Bedroom two with two 3’ twin beds. The beds are made up with high quality Egyptian cotton bed linen and luxurious towels. Family bathroom with bath with shower over, WC, basin and heated towel rail. A former potting shed adjacent to the parking area provides a warm place to sit on a sunny winter’s day. There is ample storage for bicycles, rods, golf clubs and other outdoor kit. From the cottage, stiles provide direct access across fields to the Bowmont Water, a pretty river perfect for picnics, paddling and learning to fish. Or enjoy a bracing walk to the upland reaches of the estate where you will be rewarded with magnificent views across rolling Northumbrian countryside towards the heather-clad Cheviot Hills. Riding can be arranged and the stables at Kimmerston just down the road offer riding in the Cheviot Hills as well as rides on the spectacular sandy beaches on nearby Holy Island. 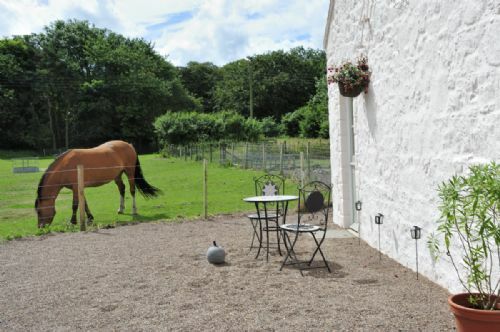 Stabling and grazing is available to guests wishing to bring their own ponies or horses at additional cost. There is fishing by arrangement for grayling, sea trout and brown trout on the pretty Bowmont Water which runs through the estate. The cottage is only a ten minute drive from the River Till one of the area’s best kept secrets with an impressive sea trout run each spring. The lower and bottom beats of the legendary River Tweed are also within easy driving distance. Well behaved dogs are welcome although we do request that they be kept on the lead when walking round the estate. Prices from £325 per week, short breaks available. Please contact us for further details. Hello, my name is Sue and myself, my husband and two dogs are looking for a quiet cottage to stay in for a week in April. 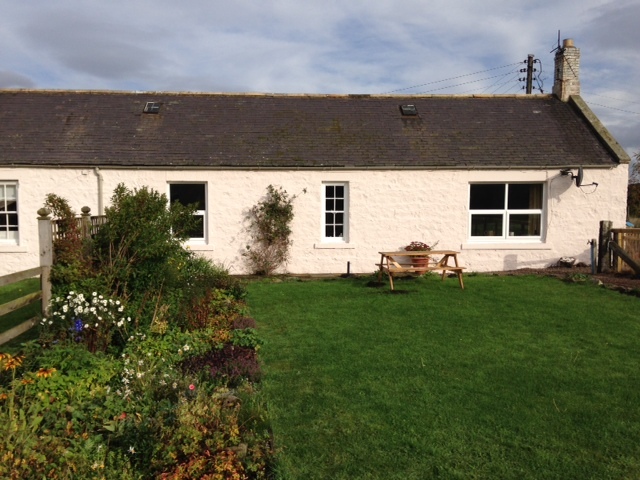 Your lovely cottage looks ideal, please can you advise us of the price for a seven night stay commencing April 18th 2015. I am looking for a cottage where me and my mum can go and relax with our three small dogs. I am looking for a four night stay commencing Monday 28th May. Could you please let me know if your cottage is available and the cost for the four nights. Much appreciated. Should take you to the site…. It would be great to see you….